The fall to the ground of the conker is a great signifier that the year is moving inexorably onwards. 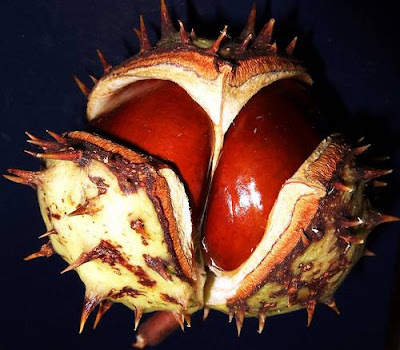 The fruit of the horse chestnut has many uses, particularly in the United Kingdom where generations of school children have played a game inspired by them. Read on to discover more uses of this noble product of the Fall! The stuff of nightmares, perhaps? 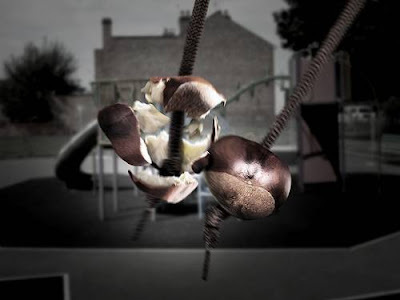 This rather spooky take on the conker looks as if it may have come from a horror film. "The Trees Have Eyes", possibly? The thought of wandering all lonesome through a wood on Halloween would be even spookier if these things were taking a look at you! Run, run! Some people have slightly dirty minds. Others can't get the wild thing out of their minds for a second. Let's think about which category you fall in to. If your mind produced an ever so slightly dirty image when you saw the above harmless horse chestnut, then you probably fall in to the latter. Autumn school yards in the UK are littered with the pulverized carcasses of conkers that have lost the ultimate fight. A hole is drilled though the conker and a string attached. Then, one small boy (small girls usually being far too sensible to take part) holds his conker at arms length. Another small boy takes a swing with his own, the aim being to smash his opponent's conker in to smithereens. If it doesn't happen, the other contestant has a turn. This follows until one of the conkers greets oblivion. If the conker has previously smashed five others, then with this it is known as a six-er. And so on! 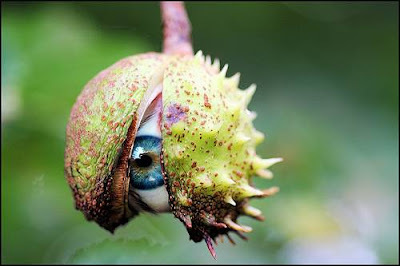 Conkers are usually gathered from the ground, even though some collectors will try to throw stones in to the branches of the horse chestnut tree to try and get some juicy looking specimen they have spotted. 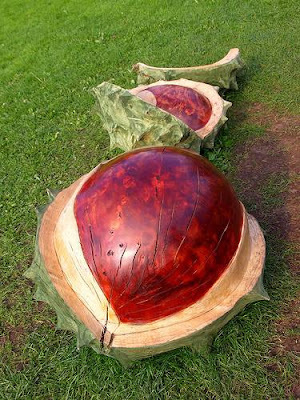 However, although the casing may look large, big conkers are often not the best to use in competition. If you are an alien with god-like powers, however, getting that particular conker down from the upper canopy is no problem whatsoever. Ah, but Mr Ambassador, you are spoiling us! 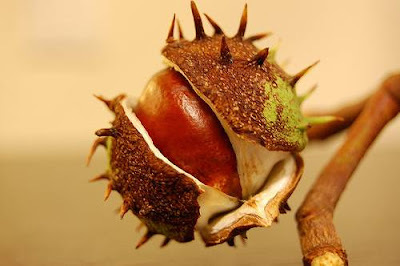 Some people believe that conkers are edible, but horse chestnuts and chestnuts are not to be confused with each other as if they are the result will be a nasty stomach ache. 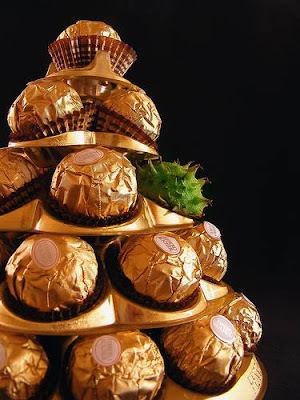 It is difficult to resist them, though, when they are presented so temptingly! 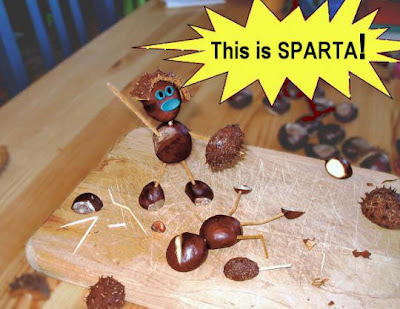 If you are of a slightly artistic bent then why not try to create your own conker people? A little ingenuity and imagination go a long way. With the credit crunch tightening wallets at the moment, why not follow the instructions here to give your children those Christmas presents they never dreamed of! Or just pile hundred up at the base of their bed and tell them to get on with it! If you are of an even more artistic bent, you can try your hand at the construction of a conker web. 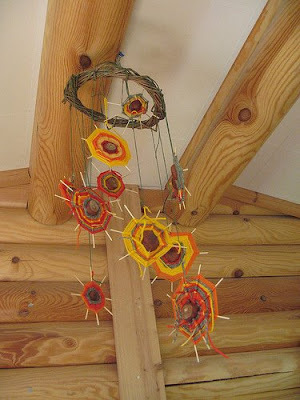 A tradition in some parts of the USA, these can them be made in to wonderful mobiles that will enhance your living space. Or make you look like an impossibly aging hippy. Take your pick! Autumn can inspire in many ways. Pity the child who finds this conker - it would be almost as large as they are! 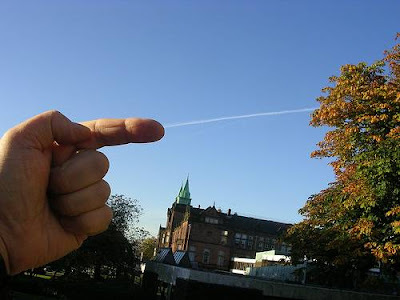 It would probably propel their opponent in to the upper atmosphere if it were ever used! Of course, this is a carving of a conker but it would amaze any young children (or adults) who were gullible or innocent enough to believe that this giant fell from a tree! There is no denying, however, that a conker is a thing of beauty. From when they open from their casing and are shiny and new, to when they are old and more than a little shriveled, the conker is for many people a wonderful thing, one of the signifiers that Fall has arrived. Ah, we love a little political correctness gone mad! In some parts of the UK, local authorities have banned the playing of conkers in their schools and work places. 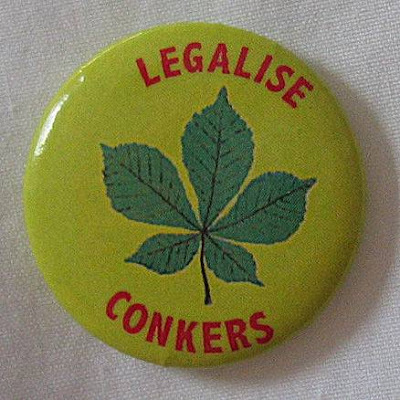 This has inevitably led to a backlash amongst conker lovers who have formed their own political campaign to legalize conkering! Only in the UK!